Popular among those adhering to grain-restrictive diets such as Paleo diets, Adkins, or any grain-free diet, coconut flour and almond flour or meal can offer gluten-free and protein-rich alternatives to traditional grain-based flours. Very often I use a combination of flours for my baking. Since coconut flour can be very dry, I find if I use some coconut flour, some almond flour, some milled flaxseed, and a new sprouted grains flour I have discovered, it evens out the texture and provides a much more balanced mixture. What is very important is to use organic almonds that have been soaked overnight and dried for usually 24 hours and then ground. Or, as an alternative, you can soak the almonds overnight, rinse well and use the almonds to make your own almond milk. When you strain the milk you will end up with a ton of “pulp” that strains out. Then you can dehydrate it and have almond meal that is perfect for baking. Almond flour is good in “quick-bread” type recipes, like muffins, nut breads, and pancakes. 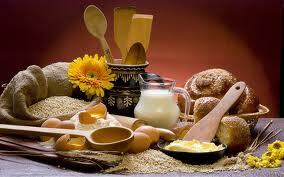 It’s not good for foods such as bread that require a real dough (you can’t knead it). Usually, more eggs are required when baking with almond meal to provide more structure. Almond meal can also be used for breading fish, but one must be careful with it, cooking at lower heat as it does burn more easily than wheat flour. Half a cup of ground almonds contains about 10 grams of carbohydrate, 6 of which are fiber, for a net carb count of 4 grams of carbohydrate. That half cup also contains 10 grams of protein, 23 grams of fat, and 273 calories. Coconut flour is a soft flour produced from dried coconut meat. It is a natural byproduct of coconut milk production. When coconut milk is pressed from coconut meat, bits of solid coconut meat are leftover and this coconut meat is then dried at a low temperature and ground until it produces a soft, fine powder which is then suitable for baking. As coconut flour is very dry, you will need to use significantly more wet ingredients and eggs than with wheat flour. At first it might not seem that way, but the coconut flour gradually absorbs more and more moisture, so you will usually find yourself adding more and more liquid ingredients. Coconut flour is rich in protein, fiber and good fat which makes it exceptionally filling. Coconut flour is also a good source of lauric acid, a saturated fat thought to support the immune system and the thyroid. Like most healthy fats, lauric acid also promotes good skin health. Coconut flour is an exceptionally good source of manganese which helps you to better utilize many nutrients including choline and biotin (found in eggs), vitamin C and thiamin. Manganese also supports bone health, nervous system function, thyroid health and helps to maintain optimal blood sugar levels. Coconut flour is not grain-based, and, as such does not present many of the issues that accompany grains. Coconut flour is gluten-free. High in rich omega-3 oils, flaxseed makes a very nice addition to our flours. I can usually find it in our grocery store or you can easily order it from Amazon. I recently started expanding my use of flours from sprouted seeds and grains and in particular I like using sprouted millet flour, sprouted garbanzo bean flour and sprouted quinoa flour. The addition of these has greatly improved the texture of the baked goods. I usually purchase these from Nuts.com, but you can also make your own if you like.